Multiple award-winning SmartLOC Rekeyable Cylinders are highly versatile, providing security capabilities of electronic locks at mechanical cylinder pricing. 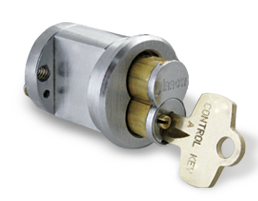 Our commercials grade, standard format 7-pin cylinders entirely eliminate lock and core changes - security and operating convenience are maximized by simply changing keys in seconds at the push of a button. Typically, a cylinder features 20 built-in user key changes and keys can be recycled indefinitely, offering maximum flexibility. SmartLOC also offers optional changeable master key capability, and changing to a new master key does not affect user keys. Whether you need to address a missing user or master key, accomodate a resident or employee transition, desire to lockdown a room, or wish to provide temporary access to a portion of a facility, SmartLOC Rekeyable Cylinders allow you to do so in seconds. From new construction to upgrades of existing facilities, SmartLOC is your solution. 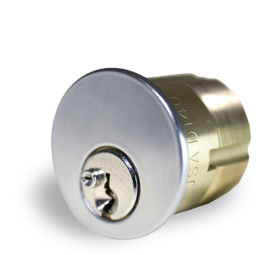 Our cylinders are compatible with virtually all major brands of commercial grade locksets, and systems can be master - and grand-master keyed. Our cylinder line is sold through traditional distribution and we proudly offer a unique PRO-LINE program for professional locksmiths and dealers. The program offers all the convenience and value of our patented key and lock system as well as providing for protected territories. Convenience & security at a valued price...your SmartLOC solution. "Within 48 hour after installing SmartLoc cylinders on my GNC vitamin store, I had to let a manager go who refused to give me back his key. It took less than 1 minute for me to change from the old key to the new key. Just this one time changing keys saved me $150. I would definitely recommend SmartLoc to any business owner"
"I own a popular yogurt store and from time to time I have employees leave without notice and it takes me just seconds to change my keys. SmartLoc is one of the most valuable security devices that I have ever invested in."